What hoplite? Greek colonist or Etruscan? (probably Early Roma too). I can tell you of Taras (Modern Taranto) because I researched it an it was pulished last week as part of my Pyrros army article. Shields had white background as authors call speak of "white shields". The Tarentine aristokrats would probaly sport a 2-bodied sphinx as it is always found on their grave and votive art. The common folk would have the Hippocampos of Poseidon. Some coins of Taras show the founding hero Tara - son of Poseidon to sport a miniature version on his buckler(!) while riding a dolphin. Remember though that "smart colonists" hired "maimland country bumcins" to do their fighting for them. For a period they hired Argive exiles hence a white shiled with no markings. If you have a colony in mind I will look it up. Are there shield designs known that are suitable for early Roman hoplites too? Well to be honest I have not delved into the early Romans. If we trust some sketscy grave stelle a medusa variant existed (Probaly Etruscan legacy). Some people argue a Chimera variant becasue of the links that the Corinthian Backhiadae family had in the area. Very speculative. Probably these symbols disapear with the abolition of monarchy in rome. Most people take the safe side and belive that the four ancinet legion symbols of eagle , wolf , boar and bull were initally the 4 phalanx taxeis symbols. Truly sorry that I cannot help much here. Quote: Truly sorry that I cannot help much here. It's already very informative! Thanks Stefanos! A have seen a number of reenacters that have a bull painted in black on a red background. Is there any evidence/speculation concerning colours used? The Italiotic Greek Colonists started initialy with the shield devices of the mother city. As each colony was "standing on its feet" and in some case it was composed from people of various localities a new emblem was chosen. The Italiotic Hoplites as the city states aquired wealth were well attired and even hat "unsuall" items in their kit. "Barbaric art" objects would not be uncommon. Threir weapons and armor more decorated. Their prime time of glory was between 500 and 400 when they repulshed the Carthagenians, crushed the Etruscans and subjugated the local tribes. After that mass negligence brought their own subjucation to the Romans. The "three military colours" red black and white dominated in the archaic era but lated more variation started. Usually the "basic three" come from pottery with all the reservations that this might bring. 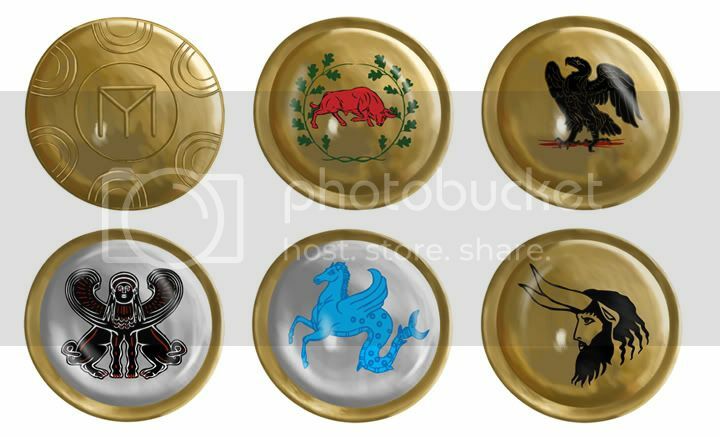 The "solar bull" existed in Europe and middle east as military symbol from the Bronze Age and most likely was the symbol of one of the 4 Roma initial core units. I suggest we create a Roman hoplite shield devices in Romans section to have the help of people who know Romans better. After all,most colonies were created in such early an age that even in Greece there were not standard shield devices for each city state,rather than tribal or personal. Isn't it right? Stefane,in most ancient coloured paintings the shields seem to be depicted with blank(bronze) background,and this is confirmed my comments like "shiny" aspises or "polishing" their aspises etc. I don't know the extend of the colours used as a background,I don't even know the percentage of shields covered in bronze -who knows!- but isn't it unlikely that one who did have a bronze faced aspis would cover its shiny surface with any kind of paint? I mean to say...would you do it?! Shield devices were standarized at the colonies round the same time as in the mainland. "Red faced pottery" gives less info than "black faced" pottery. White lykithoi are sometimes a better source and text fragments especially pottery and comentators on text. Description of religious ceremonies is another indirect source. Spartans did cover the bronze with paint and also some Athenian hieratic clans. Not to mention the "white shielded" Argives and Tarentines. Is it not possible that they even covered bronze shields to protect them from corrosion? I was under the impression that most metal/armour was painted (well into the middle ages) to protect it from corrosion? Quote: Shield devices were standarized at the colonies round the same time as in the mainland. Quote: but isn't it unlikely that one who did have a bronze faced aspis would cover its shiny surface with any kind of paint? I mean to say...would you do it?! The first units with symbols are probably the Tyrants boguards roughly from 650 B.C. At the same time the Spartans after the Messenian Wars start using unit emblems for their morae. The fall of Tyrants round 500 B.C. brings the new standard "national" emblem as the people feel confident in their new liberty. The mess created by the Peloponesian War created new factors and forced changes in the shield devices. The "national" emblems lost ground gradually in favor of the commonwealth emblems. Second line left and center is Taras.